The first time I saw a Moulton bike, it was on a Seattle Randonneur‘s 100k populaire. I’d caught up to a man on a Moulton and rode with him for a while. 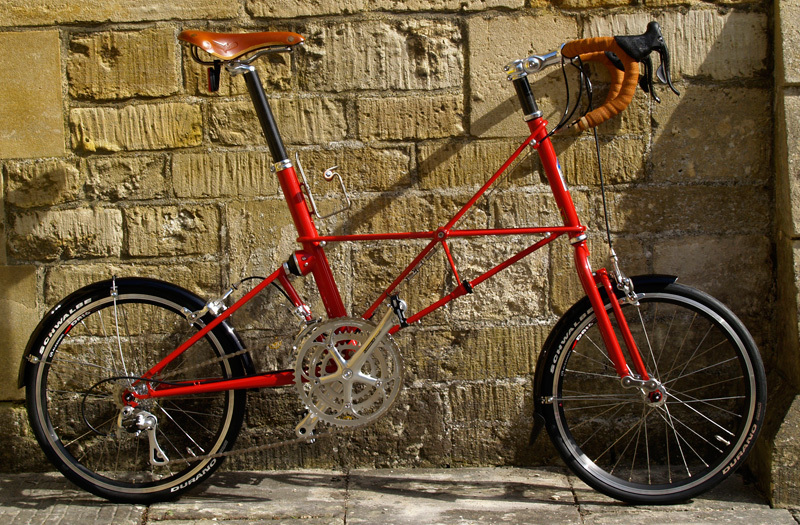 Dr. Alex Moulton’s unique design was introduced to the world with the 1962 launch of Moulton Bicycles in Bradford-upon-Avon, England. The many-triangle design is supposed to provide a natural suspension while making the bike stiff like a traditional double-diamond frame. The small wheels, run at high pressure, offer low rolling resistance. The compact design was meant to facilitate easy storage for commuters. British filmmakers/branding firm Well Plastic produced a short documentary about the company, providing a glimpse into how the frames are made and the history of Moulton. MOULTON BICYCLE COMPANY – MADE IN ENGLAND from WellPlastic Films on Vimeo. Brothers Jack, Norman, and Ken Taylor were professional cyclists in Britain in the 1930s and 40s. Dissatisfied with the equipment available to them, they began hand building their own frames. 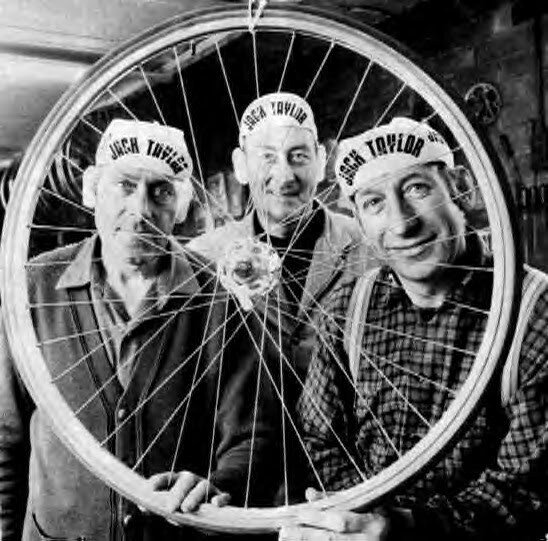 That humble start laid the foundation for Jack Taylor Bicycles, the deeply-influential bicycle company the three brothers ran together for nearly seven decades. In 1986, BBC produced a short documentary about the brothers, their history, and their work. It provides a terrific look into their craft, their attention to detail, and dedication to doing things by hand and doing them properly. In addition, the brothers speak fondly of their racing days and share their views on the changing world and industry around them. It is a fantastic way to spend 25 minutes. Tommy Godwin redefines what it means to be a dedicated cyclist. 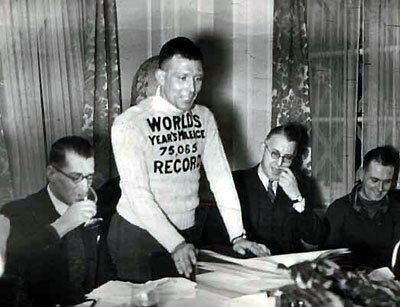 In 1939 he set the world record for most miles ridden in a year by riding 75,065 miles (120,805 kms). In order to do so, he had to average 205 miles every day for the entire year. He rode the equivalent of three times around the Earth’s circumference. 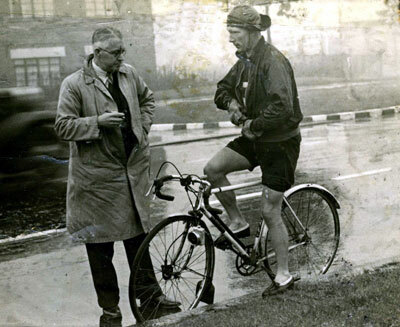 To top it off, he did all of his riding on a more than 30-pound Raleigh with a four-speed Sturmey-Archer hub (Raleigh and SA were Godwin’s sponsors). When he finished his record setting year, he spent several weeks re-learning how to walk before heading off to fight in World War II. Godwin was born in 1912 in Stokes-on-Trent, England. He began to realize his potential as a cyclist while working as a bike delivery boy for a grocer. He went on to a successful amateur and professional cycling career winning over 200 road and time trial races before tackling the world record. Cycling writer Dave Barter has details on Godwin’s history and record breaking year on his blog.